Every once in a lifetime a bike comes along that captivates imaginations and rewrites speed world records. 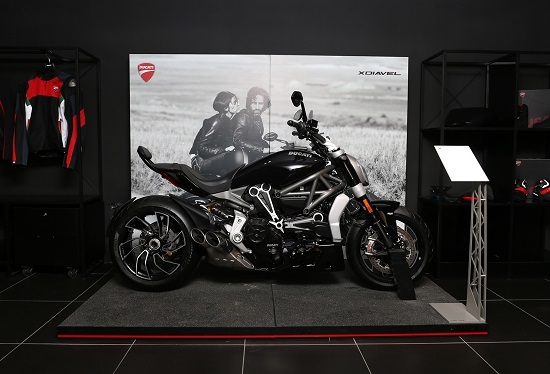 Ducati is proud to represent Italian industry, the essence of Italian style shows through the design of each motorcycle. Sinuous, seductive and flexible lines with a permanent, timeless quality that sets an unsurpassable standard. Over time Ducatis exceptionally sleek, unmatched performance and lightning speed, have earned it a global reputation for excellence and high quality. Motorrad Reisen & Sport, one of the Worlds leading motorcycle magazines voted the Ducati 916 as the Bike of the Century. The bond that starting from the racetracks, ties Ducatisti the world over to the factory itself overcomes all barriers and is expressed by the Desmo Owners Clubs. Come feel the energy and passion that the Italian motorcycling racing icon symbolises. Everything the Ducatisti desires, from the latest Ducati bikes to racing gears to safety vests and racing apparel is on display.